This series of authorized reproductions of English "Dog" cigarette cards was originally issued by Players Cigarettes in 1940. Each card portrays a different breed of Dog. The reverse side of the card has a narrative on the characteristics and history of the breed. An "authorized reproduction" means that our supplier in England has acquired the rights to accurately reproduce the original card - both front and back sides of the card. These reproductions have been issued over the years for popular Cigarette Card series where the original cards have become increasingly scarce. The images of the cards are based on paintings by Arthur Wardle (1864-1949). The focus of Wardle's work was primarily animal subjects, both domestic and exotic. He is regarded as one of the best known dog painters of the 19th and 20th century. Each cigarette card print is conservation matted. Framing services are also available. Accompanying the print is an interesting narrative on the history of the cigarette card. Click here to learn more about English Cigarette Cards. backing board using an acid-free hinging tape. drawn around the mat window - a technique called "French lining". 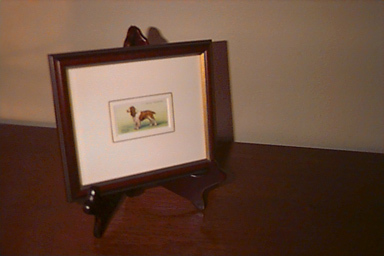 Conservation Framing services are also available. Click here to view samples of the mouldings we work with.